Sorrento’s famous American resident, the writer Francis Marion Crawford, was born on this date in 1854 in Bagni di Lucca in Tuscany. He chose to settle in later life in Sant’Agnello, just outside Sorrento, where he even had a street named after him, Corso Marion Crawford. He spent some time in India, where he found the inspiration for his first successful novel, Mr Isaacs, which was published in 1882. In 1883 he returned to Italy to settle there permanently. He lived at the Hotel Cocumella in Sant’Agnello to begin with. He then bought a farmhouse nearby, from which he developed the Villa Crawford, an impressive clifftop residence easily identifiable from the sea. The villa, which was donated to a religious order by his descendants, has been recently refurbished to include rooms let out to guests. For more information click here. Crawford found inspiration for his writing while living in Sorrento and many of his later novels have Italian settings, such as Don Orsino, published in 1892, which is about the effects of social change on an Italian family. His novels sold well in America and he would often visit the country to deliver lectures on Italian history, about which he wrote several books. 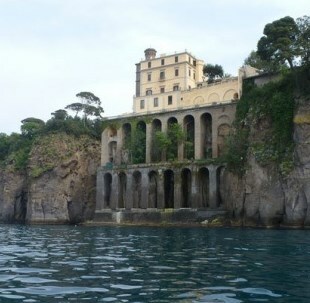 Crawford died at the Villa Crawford in Sant’Agnello after suffering a heart attack in 1909. The Corso Marion Crawford leads down to the sea from Corso Italia, the main road connecting Sant’Agnello with the resort of Sorrento. The historic Hotel Cocumella, where Crawford stayed during the 1880s, is in Via Cocumella, just off Corso Marion Crawford. 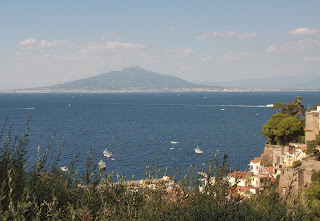 Across the sea from Sorrento, Mount Vesuvius, the infamous volcano, looms over the bay of Naples. 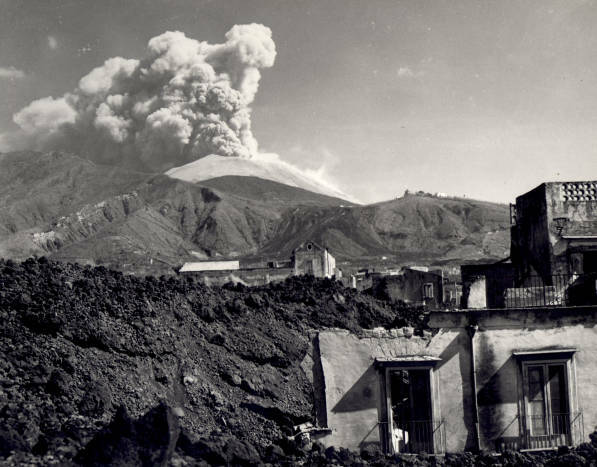 Vesuvius last erupted in 1944, 72 years ago today, the only volcano on mainland Europe to have erupted during the last 100 years. It is an easy excursion from Sorrento to visit the volcano, which is enclosed within Mount Vesuvius National Park. People continue to live on the volcano’s fertile slopes, which have been famous for centuries for producing excellent wine from the grapes grown there. The whole area was officially declared a national park in 1955. The crater of the volcano is accessible to visitors and there is a road to within 200 metres of it, but after that the ascent is on foot only. The crater is about 200 metres deep and has a maximum diameter of about 600 metres. The climb is said to be well worth it because the view from up there takes in the entire coastline from the Gulf of Gaeta to the Sorrento peninsula. To get there you can take the train from the Circumvesuviana railway station in Sorrento to Ercolano station, from where a shuttle bus will take you to the park. There is an observatory, a museum, a visitors centre, a restaurant and a shop where you can buy Lacrima Christi del Vesuvio, the wine made from the grapes grown on the volcano. But you have to sign up for a guided tour to actually descend into the crater. Vesuvius is most remembered for its eruption in AD 79, which buried the Roman cities of Pompei and Herculaneum and is believed to have killed thousands of people. An eyewitness account of the eruption, in which tons of stones, ash and fumes were ejected from the cone, has been left behind for posterity by Pliny the Younger in his letters to the historian Tacitus. There were at least three larger eruptions of Vesuvius before AD 79 and there have been many more since. In 1631 a major eruption buried several villages under lava flows and killed about 300 people and the volcano then continued to erupt every few years after that. 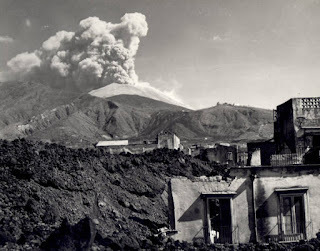 The eruption that started on 18 March 1944 and went on for several days, destroyed three villages nearby and about 80 planes belonging to the US Army Air Forces, which were based at an airfield near Pompei. Some of the American military personnel took photographs of the eruption, which have been useful for today’s experts to analyse. Since 1944 Vesuvius has been uncharacteristically quiet, although it is constantly monitored for activity and an evacuation plan is in place. Experts believe seismic activity would give them between 14 and 20 days' notice of an impending eruption. 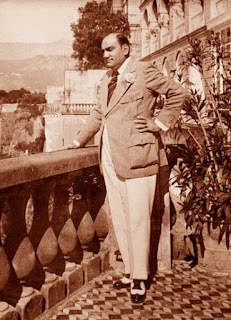 Operatic tenor Enrico Caruso, who was born on this day in 1873 in Naples, had a special relationship with Sorrento that will forever be remembered thanks to the existence of a picture taken of him only weeks before he died. 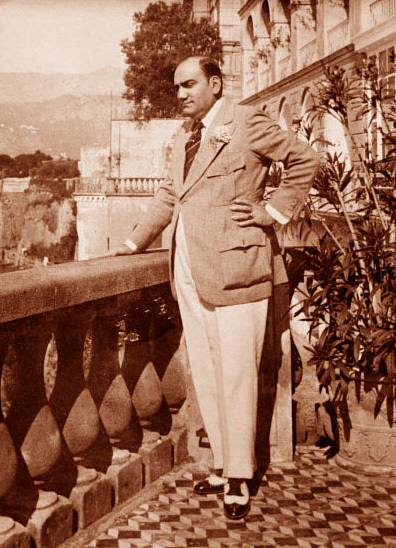 It shows Caruso standing on the terrace of the Grand Hotel Excelsior Vittoria, where he could enjoy the stunning view over the Bay of Naples. The hotel later furnished Suite Caruso with the piano and writing desk used by the opera singer during his visit. The suite inspired the song 'Caruso’ to be written by Italian pop singer Lucio Dalla in the late 1980s while he was staying at the Excelsior Vittoria. Believed by many opera experts to be the greatest tenor of all time, Caruso graced many of the most famous opera houses in Europe and America during a brilliant 25-year singing career. He made more than 200 recordings, some dating back to 1902, and was opera's first international star. Born in Via San Giovanello agli Ottocalli in Naples and baptised the next day in the nearby church of San Giovanni e Paolo, he was apprenticed to a mechanical engineer at the age of just 11 years and also worked alongside his father in a factory. But at the same time he was singing in his church choir and was told his voice showed enough promise for him to consider becoming a professional singer. He was encouraged by his mother until she died in 1888. To earn money, he started to work as a street singer in Naples, progressing to singing Neapolitan songs as entertainment in cafes. 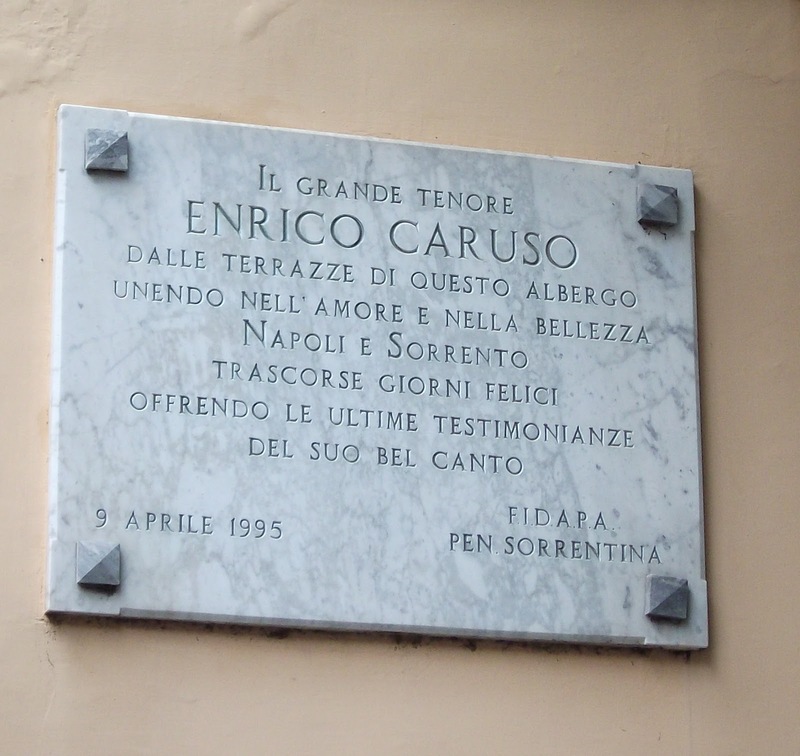 Determined he would become an opera singer, Caruso took singing lessons before, during and after his compulsory military service. Caruso went on to perform at other theatres throughout Italy and was given a contract to sing at La Scala in Milan in 1900. On his debut on December 26 he sang Rodolfo from Puccini’s La Boheme, conducted by Arturo Toscanini. Caruso took part in a grand concert at La Scala organised by Toscanini in 1901 to mark the death of Giuseppe Verdi. A month later he was engaged to make his first group of recordings for a gramophone company using a hotel room in Milan. The recordings quickly became best sellers and Caruso’s fame spread. He travelled to New York in 1903 to take up a contract with the Metroplitan Opera, making his debut in Rigoletto in November. A few months later Caruso began his association with the Victor Talking Machine Company. His 1904 recording of ‘Vesti la giubba’ was the first recording ever to sell a million copies. He made 863 appearances at the Met, attracting a substantial following from among New York ’s Italian immigrants. He continued to release recordings until close to his death in 1921. Caruso’s voice extended up to high D-flat in its prime and grew in power and weight as he became older. His singing can still be enjoyed by people today as his original recordings have been remastered and issued as CDs and digital downloads. The singer’s health began to deteriorate in 1920 and he returned to Naples to recuperate. 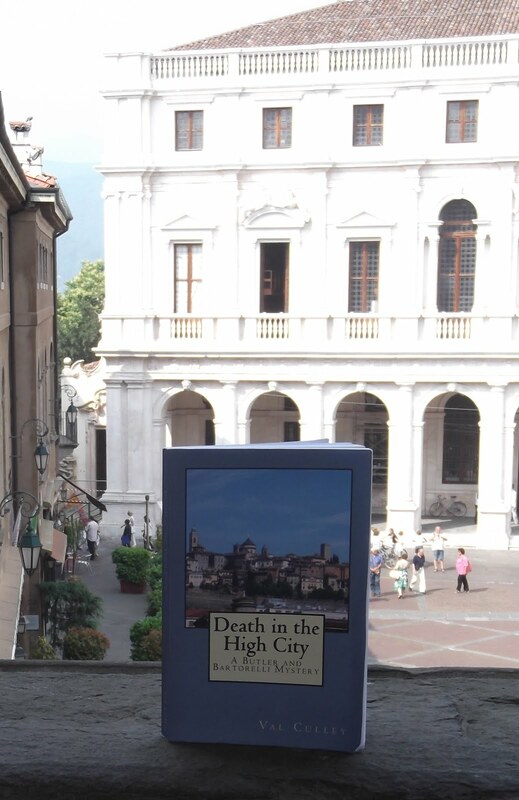 He was planning to go to a clinic in Rome in August 1921, but while he was staying overnight at the Albergo Vesuvio in Naples on the way to Rome his condition worsened and he died there, aged 48. The King of Italy, Victor Emmanuel III, opened the Royal Basilica of San Francesco di Paola -- on the west side of the Piazza del Plebiscito in Naples -- for his funeral, which was attended by thousands of people. 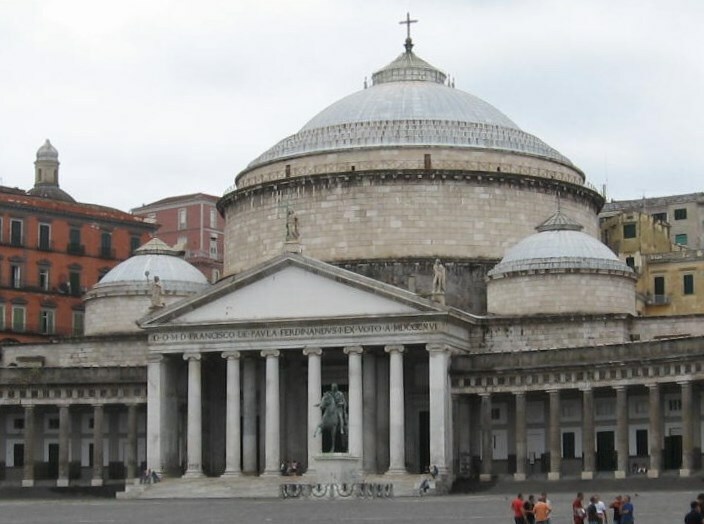 The Basilica is similar in design to the Pantheon in Rome with a portico resting on columns and a high dome in the middle. 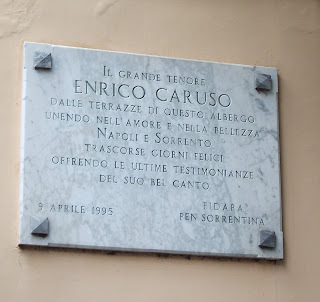 Caruso’s body was taken through the streets of Naples in a horse-drawn hearse and he lay in state before his funeral so that people could pay their respects. In Sorrento, there is a plaque in his name at the main entrance gate to the Grand Hotel Excelsior Vittoria, which is just off Piazza Tasso.